The first such piece was on Jimmy Nelson. 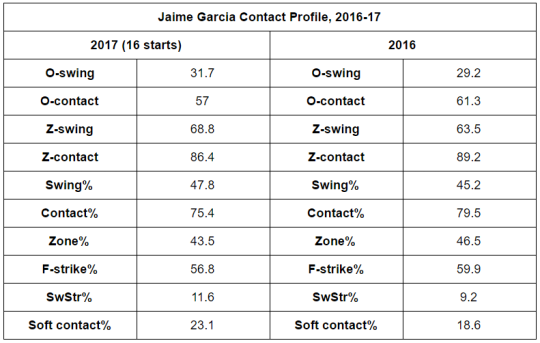 This one checks in on Jaime Garcia, on whom the Braves reasonably gambled by giving up three lower ranked prospects. I felt that if he could get on pace to be worth three-ish wins that Atlanta could flip him at the deadline for better prospects than they gave up. But to do that I thought he’d need to do something about the movement of his slider, which had become a sweeping, lateral thing. I also thought he could benefit by closing the velocity gap between that and his sinker. Certain findings didn’t bear that out for pitchers overall, but I still felt it could help Garcia, in particular, given the way his offerings moved on hitters and considering the same gap in his most successful seasons. Before we get to that, it’s worth digging into his contact profile this year, compared to last year. Overall, Garcia is generating more swings while hitters are making less contact. The numbers aren’t eye-popping but they’re enough that they should be contributing to a difference. His 11.6% swinging strike rate is 17th in the majors right now, and he’s inducing more soft contact than he has since 2011. And yet, Garcia is putting up an ERA almost identical to last year and an xFIP that’s half a run-per-nine worse. He’s striking out less and walking more. He’s been worth less than one win and is on pace for just under two for the season. The movement here, per Brooks Baseball, tells us two things: the horizontal run on the ball is moving in on righties and away from lefties slightly less than it did last year, and the vertical drop on the ball is even less. It’s actually performing like a cutter. The velocity on Garcia’s slider is slightly up this year, and the gap between that and his sinker is just shy of 9 miles per hour. Compared to last year, it’s decreased by about a half mile per hour – not a lot. Combine it with less bite and we can see how he’s inducing more soft contact, but also how it simply might not be strong enough to bring down his ability to prevent runs. Despite this, I could still see teams taking a chance on acquiring Garcia at the deadline. The whiffs are up and he’s not getting knocked around a ton overall, even after a rough go in his last handful of starts. Atlanta will have to make a decision in the next couple weeks. Do they want to try to extend a league average but experienced starter for their young staff, or do they want to try to upgrade on the prospects they gave up for him in the winter? Given the value of a league average starter in the current run-crazy environment, I could see them holding out for a prospect overpay.